How should Western governments deal with the Islamic Republic of Iran, which Washington labels "the most active state sponsor of terrorism"? Iranian aggression began in 1979, with the seizure of the U.S. Embassy in Tehran, and the holding of some of its staff as hostages for 444 days. Major subsequent attacks included two bombings in Beirut in 1983: at the U.S. embassy, killing 63, and at a U.S. Marine barracks, killing 241. 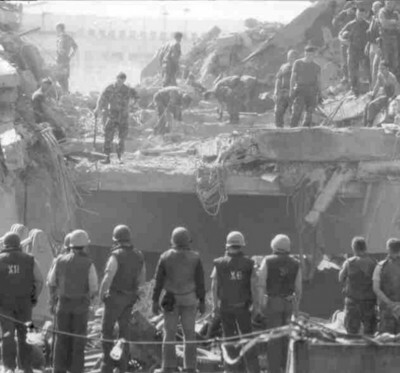 The Iranian-backed attack on the U.S. Marine barracks in Beirut in 1983 killed 242, still Tehran's single largest number of Western fatalities. More recently, U.S. secretary of defense Leon Panetta stated, "We're seeing more of those weapons going in [to Iraq] from Iran, and they've really hurt us." Mike Mullen, chairman of the Joint Chiefs of Staff, added, "Iran is very directly supporting extremist Shiite groups, which are killing our troops." American responses fall into two main camps: tough and diplomatic. The first sees Tehran as irredeemable and counsels a policy of confrontation and even force; it assumes that diplomacy, sanctions, computer viruses, and threats of military strikes have no chance of dissuading the mullahs from going nuclear, and it speaks of regime change or a military option against the Iranian bomb. The diplomatic camp, which generally controls U.S. policy, accepts the permanence of the Islamic Republic of Iran and expects Tehran to respond to diplomatic overtures. A main battleground in this dispute is the question of whether or not the most prominent Iranian opposition group, the Mujahedeen-e Khalq (MeK), should remain on the U.S. government's terrorism list. The tough camp generally views the MeK, founded in 1965, as a lever against the mullahs and (with a minority dissenting) wants it delisted. The diplomatic camp argues that delisting would anger the Iranian leaders, hampering efforts to improve relations, or (contradictorily) would limit Washington's ability to reach out to the Iranian street. The pro-MeK side argues that the MeK has a history of cooperating with Washington, providing valuable intelligence on Iranian nuclear plans and tactical intelligence about Iranian efforts in Iraq. Further, just as the MeK's organizational and leadership skills helped bring down the shah in 1979, these skills can again facilitate regime change. The number of street protestors arrested for association with the MeK points to its role in demonstrations, as do slogans echoing MeK chants, e.g., calling Supreme Leader Ali Khamene'i a "henchman," President Mahmoud Ahmadinejad a "dictator," and shouting "down with the principle of Velayat-e Faqih" (that a religious figure heads the government). 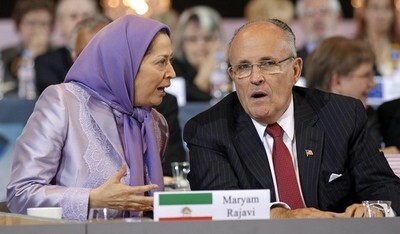 Maryam Rajavi, head of the Mujahedeen-e Khalq, with Rudy Giuliani, former mayor of New York, in June 2011. A number of former high-level American officials advocate delisting the MeK, including a national security adviser (James Jones), three chairmen of the Joint Chiefs of Staff (Hugh Shelton, Richard Myers, Peter Pace), a secretary of Homeland Security (Tom Ridge), an attorney general (Michael Mukasey), and even a State Department coordinator for counterterrorism (Dell Dailey). A chorus of prominent Republicans and Democrats favor delisting, including a bipartisan group of 80 members of Congress. The anti-MeK faction does not address the benefits of delisting but argues that the U.S. government must continue the listing on the basis of allegations of terrorism. Their indictment notes that the MeK killed six Americans in the 1970s. Whether or not these allegations are accurate, a terrorist incident must have occurred within two years to continue with the terrorist-group designation—rendering discussion of the 1970s completely irrelevant. What about the past two years? The pro-MeK side points to three main U.S. terrorist databases—the RAND Database of Worldwide Terrorism Incidents (RDWTI), the Global Terrorism Database (GTD), and the Worldwide Incidents Tracking System (WITS) -- and notes that in each one the MeK comes up clean since 2006 or earlier. What about capabilities and intentions? The State Department's 2006 "Country Reports on Terrorism" accused the MeK of maintaining "capacity and will" for terrorist acts but the 2007, 2008, and 2009 reports omitted this statement. Britain's Court of Appeal derided proscription of the MeK as "perverse," and the group was removed from the U.K. terrorist list in 2008. The European Union cleared the group of terrorism charges in 2009. The French judiciary dismissed all terrorism-related allegations against the group in May 2011. In brief, the argument to maintain the MeK's terrorist designation is baseless. Following a court-mandated review of the MeK's terrorist designation, the secretary of state must soon decide whether to maintain this listing. With one simple signature, the Obama administration can help empower Iranians to seize control over their destiny—and perhaps end the mullahs' mad nuclear dash.